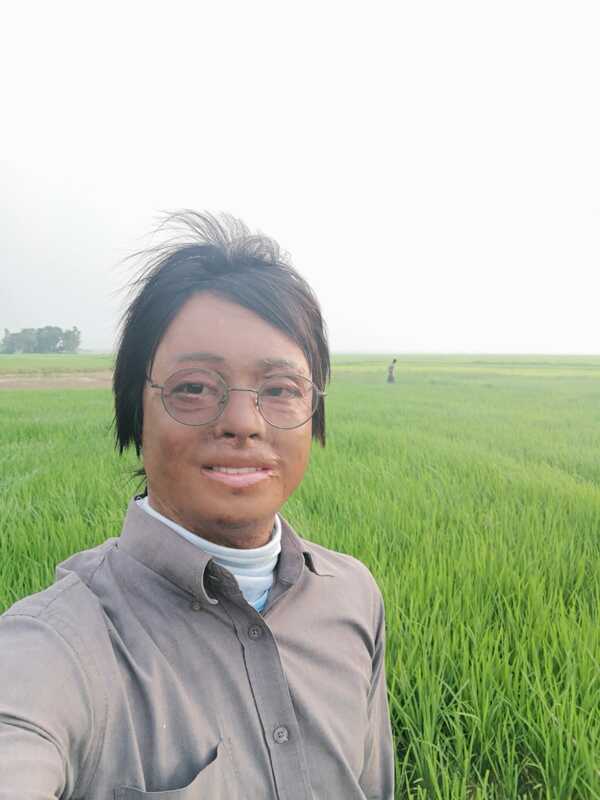 Rahman Mohammad Ataur was the victim of a workplace accident in June 2016 that left him severely burnt and unable to carry on working as a migrant worker in Singapore. However, the 23-year-old says that, through the incident, he has been able to find new friends, and through their support, hope for his future. Photo by Rachel Phua. Inside a vast auditorium, as the air-conditioning quietly hums, Rahman Mohammad Ataur thinks back on his six-month stay in a hospital, three of them in a coma. A workplace accident had left the migrant worker with third-degree burns on 73% of his body. Now, close to two years later, there is little indication of the torment the 23-year-old went through. He is mostly composed and reserved, excitable only when he recounts the incident, ruffled when he gets on the phone with a manpower ministry employee about his case. Rahman’s appearance is the only outward sign of the Bangladeshi’s slight self-consciousness. He has kept his hair long enough to hide his ears, which were recently surgically elevated so that he could wear his spectacles and hearing aid. His long, thick sideburns are tucked underneath a scarf, and on top of that, a cap. Every time we meet, he is in a long-sleeved shirt. He puts on fingerless gloves to protect his hands. Rahman says he has mostly regained his strength, but he cannot pick up a needle because he does not have fingernails anymore. The young man’s cool-headedness is no miracle. Rahman attributes the peace within to the Christians who have become like a second family. In June 2016, Rahman’s life took a turn. 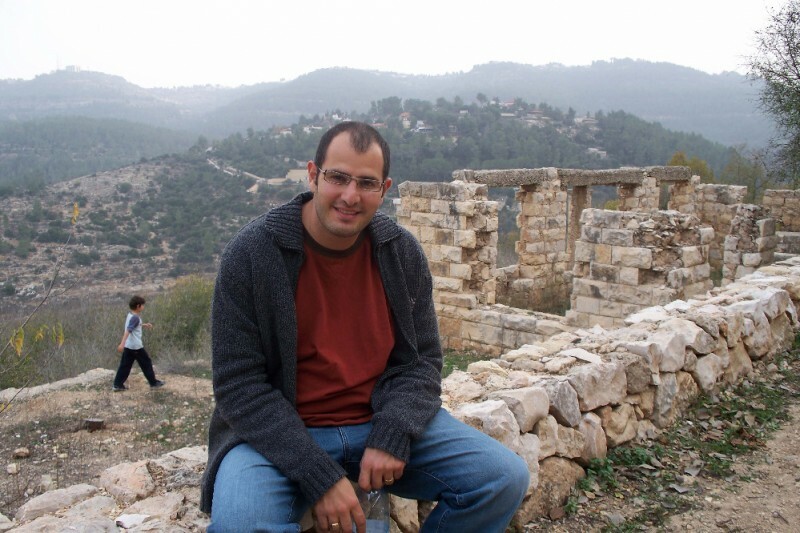 Having worked a year at a landscaping firm, he was considered senior among the firm’s workers. On that day he was tasked to clean an underground tank while guiding a junior on the job. The vessel emanated a strange smell, but his boss dismissed his worry, Rahman claims. Rahman’s last day in Singapore was August 20, 2018. A HOME volunteer followed him back to Bangladesh for a week to help him settle back home. Photo by Rachel Phua. It was pitch black, so Rahman and his partner took a halogen lamp down the three-metre container. Once he flicked on the switch, the tank exploded. Rahman’s colleague was immediately blown out. He was trapped inside, disoriented and blinded. Rahman tried to climb out but there was no grip – his skin was peeling off. Eventually, his colleagues who were on the ground managed to pull him out. “I thought to myself, ‘Today is my last day’,” he says. The next phase was equally brutal. When he woke up from a three-month coma, Rahman found himself surrounded by tubes, unable to speak, extremely thirsty. Over the next three months, he was in and out of the operating theatre two to three times a week. The accident caused Rahman to lose function of his nose, eyes, lips, eyelids, eyebrows and ears, before they were reconstructed surgically. Skin had to be grafted onto his upper body and arms. His internal organs were infected as his immunity was weakened. Rahman was discharged in January 2017. He went back to his dormitory to recover. Co-workers brought him dinner every evening – they had to work in the daytime – and someone from the company would drive him to and from the hospital when necessary. But otherwise, he was ignored, surviving on one meal a day, Rahman alleges. 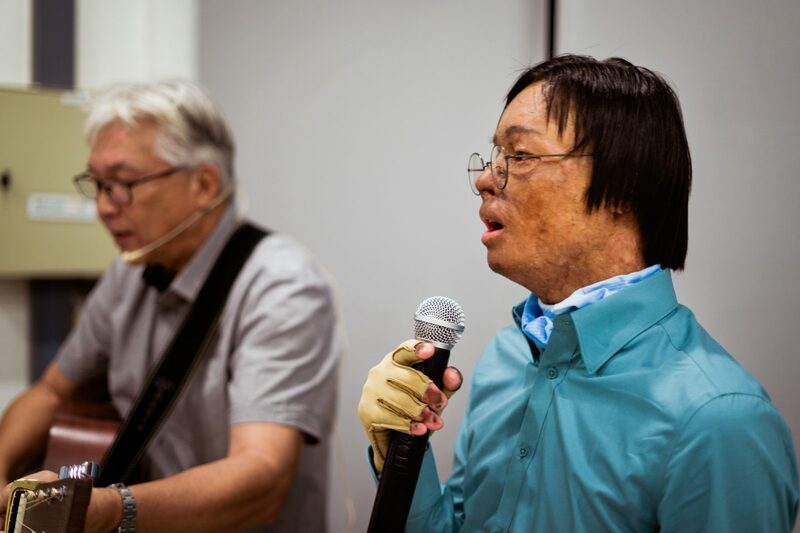 A month later, Rahman’s employer stopped giving him rides and he had to take the public transport down to Singapore General Hospital (SGH) for his checkups. Since he had to wrap his face, people looked at him strangely, Rahman said, while the station staff would stop him to question him. On board, the seats on his left and right were always empty. “This was a more painful time,” he says. Soon after, Rahman reached out to Humanitarian Organization for Migration Economics (HOME), a non-profit organisation that supports migrant workers. Some of its volunteers had visited him in hospital after a medical social worker at SGH got in touch with them, he says. As HOME worked on his case, Rahman hung out at their office in Paya Lebar. It was there that he met a volunteer called Kevin Ong, who went up to him to introduce himself after he saw Rahman sitting alone one day. Rahman’s newfound friends from Singapore came down to the airport to say their goodbyes. Photo by Rachel Phua. Rahman recounted his misfortune to Ong, and they proceeded to exchange numbers after Ong, a Christian, asked if it was okay be friends. He was wary of the good-natured candour. “What does he want from me?” he wondered. Back home, no one would offer a hand if it did not benefit them, he thought. But Rahman had nothing to lose, so he tagged along for dinners and shopping trips with his new bud. Besides bringing Rahman out, Ong started a campaign within the church which raised about $10,000 to supplement Rahman’s livelihood and pay off some of his medical bills. 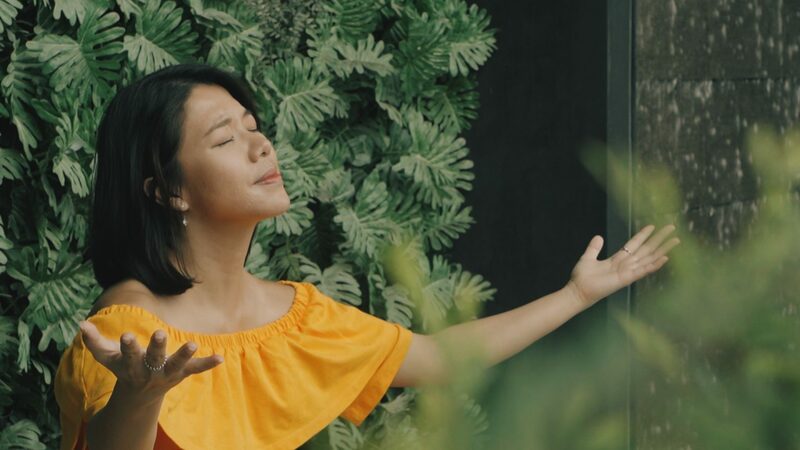 Ong, who is from Bethesda (Bedok-Tampines) Church (BBTC), says that he sensed God wanting him to show His love through the friendship (Matthew 9:35-38). 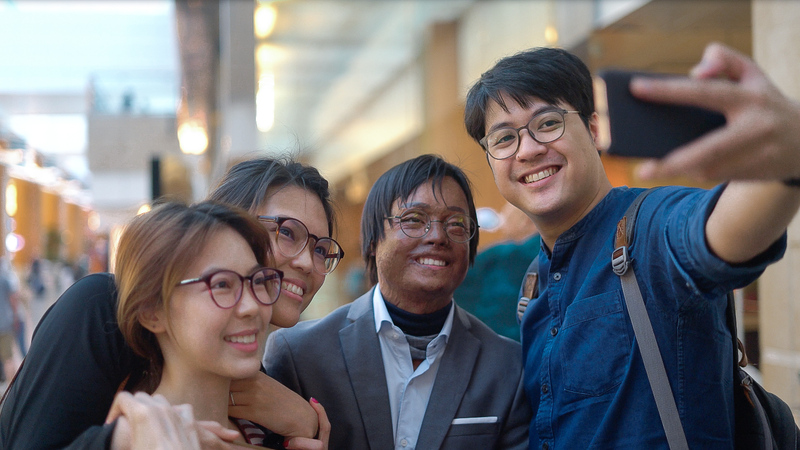 One day, Rahman bumped into Ong’s mum, who recognised him – Ong had told his family about Rahman – and invited him to her church’s Easter Sunday celebration. Ong had a role as a robot and she would buy the tickets if he was willing to go, she told Rahman. That weekend, Rahman made even more friends. Word about his situation had gotten out among the Ong family’s circle and they were concerned about this young man’s plight. Subsequently, the older folks brought him out for meals and around Singapore. 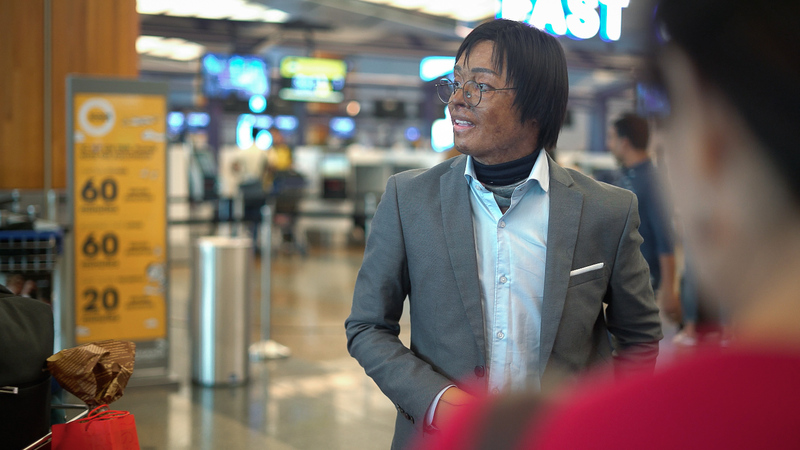 For the next two Chinese New Years, Rahman had homes to visit. Through Ong, Rahman met many other Christians whom he says, treated him like a friend and son. Photo by Rachel Phua. “It’s not like they just bought me dinner or gave me some money. Anybody can do that. But they took care of my whole journey and treated me like their son,” Rahman says. John Tan, a member of BBTC who met Rahman through his cell group, is Rahman’s unofficial financial advisor. Tan, a retiree, says he lent a hand as his way of blessing others as God has blessed us (1 John 4:19, James 1:17). 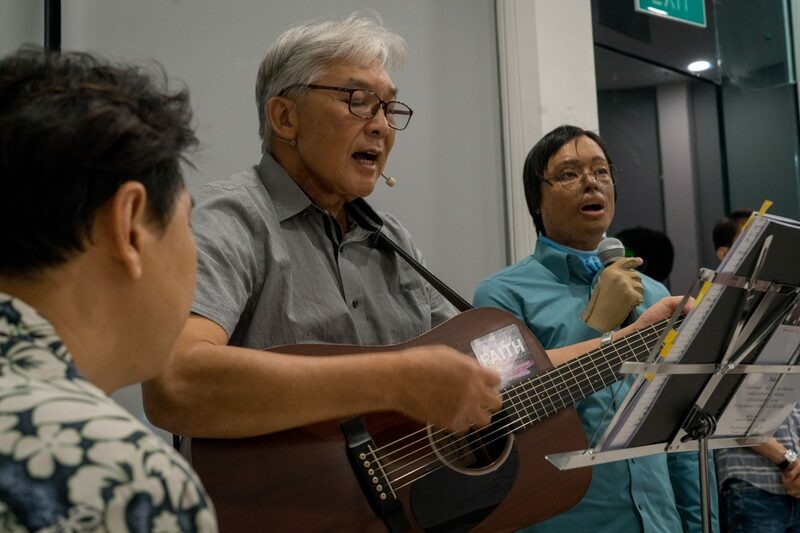 In December 2017, members of Paya Lebar Methodist Church found out about Rahman’s condition as well, and the church contributed financially from their Jubilee Fund – a fund for assisting migrant workers – for his ear and facial operation, knowing it would be harder for him to find treatment back in Bangladesh. Rahman also attended the church’s computer classes. Rahman is back in his hometown of Pabna, Bangladesh, spending time with his family and settling the bank loan he took to come to Singapore. Photo courtesy of Rahman Mohammad Ataur. Rahman says the accident has caused him to look at life more positively. Whenever he feels despondent observing “normal people” out and about, he tells himself that at least he has accomplished what he always wanted to do: Serve others. He volunteered at HOME as a translator and also advised other Bangladeshi workers on their claims. He turned up at the office nearly every afternoon. 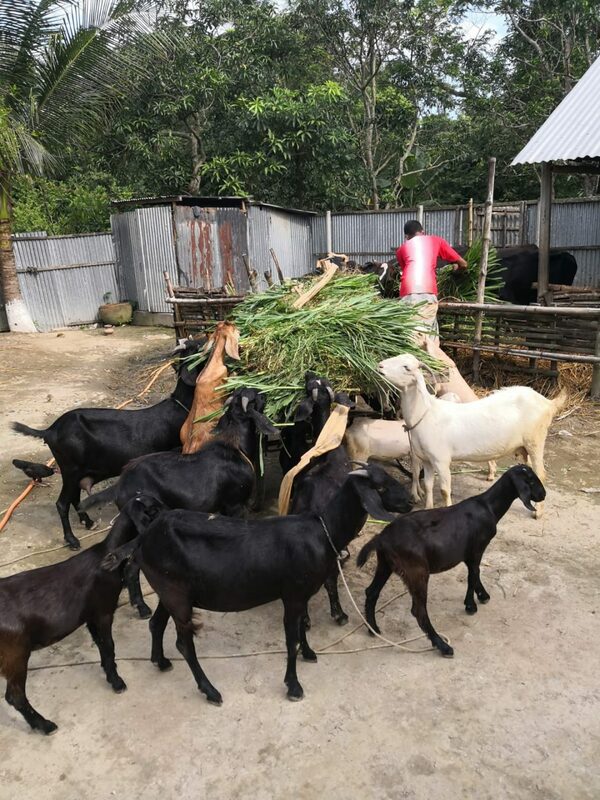 Coming to Singapore, his goal was to make enough money so that he could open a small business back home to provide for his impoverished family and eventually the other children in his hometown, a village near Pabna in Bangladesh. He did not want his three younger siblings, nor the rest of the kids to end up like him – unable to attend school because his family did not have enough money. After primary school, Rahman had become a farmer, helping his dad harvest vegetables such as onions and chillies on rented land. It would have cost him just S$10 to enroll in secondary school, he says. But he did not have that. Rahman’s dream of making enough as a migrant worker in Singapore is put on hiatus for now. But meanwhile, he picked up English language and computer literacy skills during his time volunteering at HOME. Rahman says the accident has, in fact, propelled him to achieve his purpose in life – to help other marginalised people like him. He started volunteering with HOME as a translator in March 2017, two months after he was discharged from hospital. Photo by Rachel Phua. The weekend after our interview, Rahman’s friends from BBTC held a farewell party for him. 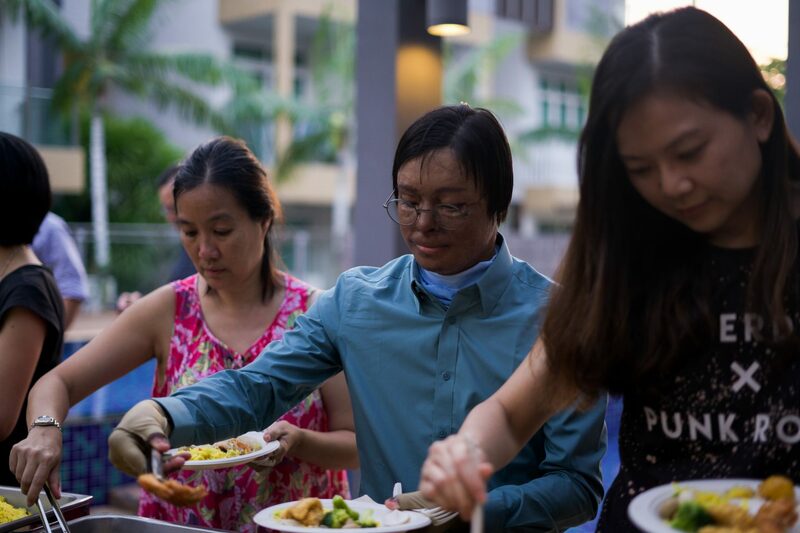 More than 50 well-wishers turn up at a condominium function room in Tanah Merah, including a doctor from SGH, other members of the church, staff and volunteers from HOME and fellow workers. Rahman is returning to Bangladesh since he received his work injury compensation claim from his employer’s insurer. Rahman says he is able to forgive his former bosses because of the love he has received from the friends he made in Singapore. In his speech, Rahman thanked the various groups in the audience. HOME gave him the chance to feel useful again, the doctor did more than was required, and Christians treated him like a brother and son. He said he has regained his confidence because of their support. Rahman was without his cap, his dark brown hair pressed down against his face, reflecting the glow of the evening sun. Despite the irreversible damage, Rahman says he has stopped blaming his former employers. “Yes, they did wrong, but I feel there is no point in complaining, because they could not have guessed this outcome. If they knew they would not have given me those orders,” he says. Several members of Bethesda (Bedok-Tampines) Church held a farewell party for Rahman in late July. Fellow migrant worker friends, volunteers from HOME, and a doctor from Singapore General Hospital who had attended to him were some of the guests. Photo by Rachel Phua. 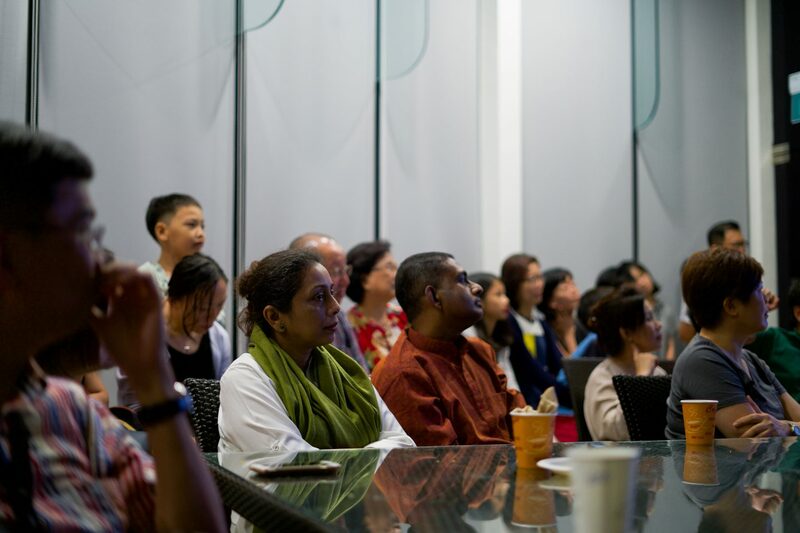 As a former migrant worker, Rahman hopes that Singaporeans can have more empathy towards people like him. He urges bosses to see them as human beings too, and provide time for adequate rest rather than rush a project and overwork their staff. He also remembered how, when he took public transport, Singaporeans tended to avoid him and other foreign workers due perhaps to their dishevelled appearance. But that is because they have nowhere to wash up or change out of their uniforms at their workplaces, he says. It would be nice if locals were still willing to sit next to them and strike up a conversation, he adds. During the farewell party, Rahman gave a speech thanking the attendees. He says their kindness has helped him to regain his self-esteem and optimism. Photo by Rachel Phua. Michael Cheah, the executive director of HealthServe, a non-profit organisation that provides health and social assistance to migrant workers, says that Singaporeans should put themselves in the workers’ shoes. Many of them left their families and friends behind and took the risk of being possibly exploited to “earn an honest living” here. “Would we have the strength to do the same?” he asks. Christians who want to do more for transient workers should start by interacting and building relationships with them. Christians who want to do more for transient workers should start by interacting and building relationships with them, he says. It is when people give them hope and a place to temporarily call home that their lives are transformed. And though some believers are mainly concerned about evangelism when they befriend foreigners, it is Christ who saves, not us, Cheah adds (John 6:65). As of late August, Rahman is back in Bangladesh, spending time with his family and settling his bank loan. He had spent $16,000 to get a job in Singapore. He does not know what his next step will be but he hopes to come back to Singapore to work in a less physically strenuous capacity. He is still in touch with the Christian community he met here, some of whom are helping him make those plans tangible. Rahman says that he will try to look for work in Singapore again, despite his accident. Photo courtesy of Rahman Mohammad Ataur.